Growing up Catholic in a small town in landlocked Iowa during the 1960s, eating fish on Fridays (serving something vegetarian in our farming culture was unheard of – as much a sin in many households as eating meat!) meant if you wanted fresh, you’d probably have to catch it. The other options were the Friday Fish Frys, sometimes at a Church basement or hall (and those are still going on in the Midwest, especially in Minnesota (land of 10,000 lakes where Walleye reigns) and Wisconsin (which nestles up to both Lake Michigan and Lake Superior). And we can’t forget the frozen fish sticks, which my Mom refused to serve. Mostly, people relied on the ubiquitous canned Salmon or Tuna. Me, I was obvs NOT down with the Salmon Loaf! And it wasn’t just my Grandma that made it, or my Mom. I think every family pretty much made the same Old Fashioned Salmon Loaf. And I can tell you the recipe off the top of my head. 1 can of Salmon, 1/2 a sleeve of crackers, crushed, enough milk to moisten the crackers and an egg. Mush it together till it’s heavy and dense and bake it until it’s dry and horrible. Make your kids, who were taught to clean their plate obediently without ever a word of objection lest they be sent from the table (or worse) eat it. My gosh, it’s a wonder I ever liked food at all, let alone became a food blogger! Luckily, Mom became a fantastic cook, later! And it’s a wonder I ever decided to make Salmon Loaf some 50 plus years later and post it here, but I had an inkling it could be done – and done well. And so here’s Not Grandma’s Salmon Loaf. The flavor’s spot on, traditional, without any real twists and just a little boost, here and there, but what really makes Not Grandma’s Salmon Loaf is the texture. This Salmon Loaf is a bit lighter, moist (Why Do People Hate the Word Moist?) and a little souffle-like and bakes up with a just the nicest, crispy top. It’s a play on flavor, texture, and contrast and that makes all the difference in the world. Not Grandma’s Salmon Loaf would be great with a little cream sauce, maybe something with lemon or dill, but I got around all that by refashioning another bane from my childhood. Creamed peas and/or pearl onions. Honestly, I don’t know how I got by with it at the table but as a child, I’d very carefully nudge the peas and/or onions aside and eat the sauce, only. I’d pick it up between the tines of my fork! Well, the sauce is the BEST part, after all! 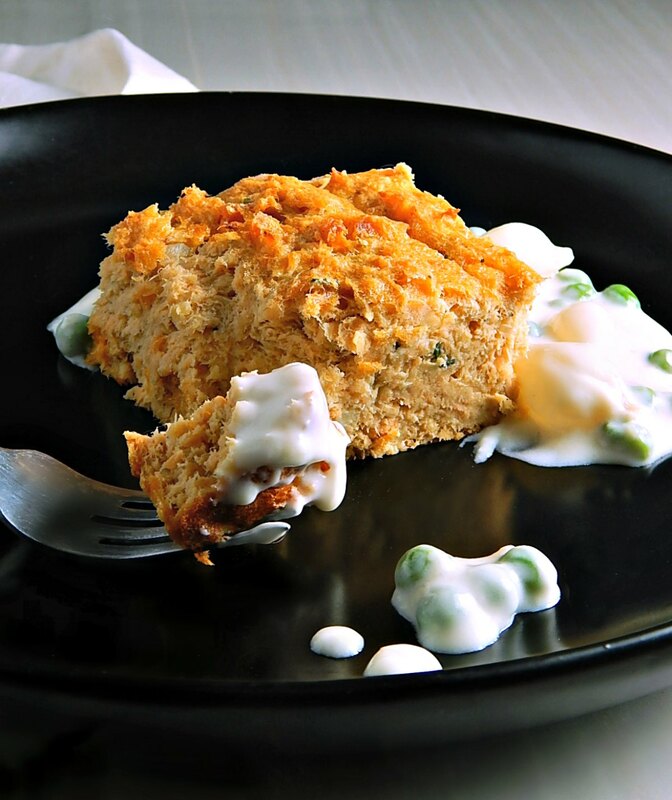 I’m betting you won’t be able to resist (I couldn’t) dragging each forkful of your Not Grandma’s Salmon Loaf through that creamy deliciousness! I forgot to put lemon wedges in the pics – that’s always recommended! First of all, let’s talk about the Canned Salmon in this recipe. Speaking of terror, that’s an ingredient that scares a lot of people off (and yeah, it used to scare me!) from home cooks to Chefs. Really, it’s just Salmon, and often wild-caught Atlantic salmon, that’s bland, overcooked, and packed, usually with a bit of skin and some small bones. I’m gonna show you how to take care of it easily, and I have a post, “What to do with that Can of Salmon Lurking in the Pantry?” that’s gonna help you out. Then you’re going to want to really mush your Salmon up well, even before you add any of the other ingredients. I didn’t want to use too much “filler” with this recipe, but you’re going to need about a half a cup of breadcrumbs (check out my post on homemade breadcrumbs if you want to make your own) or oatmeal or crushed up crackers to make it work and hold together. I’ve only ever used the crackers. And you’ll need a little liquid to soak any of the above, in. Now, some people like to use the liquid the Salmon is packed in for more salmon flavor; at my house, the Homer the Cat and Chance the Deplorable Labradorable usually get a bit of that. I like to use about 1/4 cup of milk. Use whichever you’d like. As far as the onion, very finely dice it so it cooks through; if it’s larger, you’ll have chunks of raw onion and that can be obnoxious. What makes this recipe for Not Grandma’s Salmon Loaf work is how moist it is and the semi souffle-like texture. That means butter (something missing from Grandma’s recipe) and three eggs. In a pinch, you can make this without separating the eggs and beating the whites to a peak, then folding them in, but it will be heavier and a little wetter. When you take that extra step and beat the egg whites, The Not Grandma’s Salmon Loaf will rise up as it bakes and then settle down a bit. It’s done when the top is lightly golden brown and just a little crusty. Don’t overbake it! Of course, the priciest ingredient in this recipe is the canned Salmon (and if you have leftover Salmon in this much quantity or want to use fresh or frozen Salmon, it will work, too) so shop carefully for it. If you’re not aware of Lent and the amount of fish and seafood sales it generates (most ads at the store won’t say Lenten sales, although some do) see my post on Easter & Lent, Leveraging the Sales. You want to be putting your food dollars on the items that are the best bargain and stock up – Buy Low. Literally fill your freezer with fish and seafood for the year if you use the frozen products and do the same with the canned Tuna & Salmon. In my post on What To Do With That Canned Salmon Lurking In Your Pantry, I talk about dealing with the Salmon and also a bit about comparative pricing and the best places to buy. And just FYI, there’s been no compensation for showing that pic of canned Salmon’ I just wanted you to see that there are brands of wild-caught salmon. It can be a great budget alternative and time saver. Eggs, of course, are also cheap during the Easter & Lent sales, so stock up on them and eat more of them! Mine this week 88 cents as opposed to $1.89 at the regular price. I’m going to be eating more eggs, a great, inexpensive source of protein. I’m usually brand particular on saltines but at three times the price of the bargain store brand? No more. I’ll suffer the very slight difference, especially since I usually crush them and use them in soup or recipes like this. And do grow your own herbs; they’re a great way to add a special touch to whatever you’re making and a pot of herbs is usually around the same price as buying a packet. If you kill them, dry them! It’s a no-lose proposition. In a small bowl, add the crackers, milk and three egg yolks, mix together and set aside to soak as you prepare the rest of the ingredients. In a larger bowl, add the salmon and with clean hands or a fork mash and mush to break down the larger pieces. No need to mash to a paste but be thorough. Add and gently mix in onions, butter, lemon juice, parsley, salt and pepper, and the reserved cracker/milk/yolk mixture. In a small bowl, beat the egg whites on high speed until stiff peaks form. Mix 1/3rd of the egg whites into the salmon mixture to lighten, then gently fold in the remaining egg whites in two additions. Transfer to a greased 8×4-inch loaf pan or equivalent sized small casserole. Bake for 30 to 40 minutes (the loaf pan will generally take longer) or until the top is a golden brown and a knife inserted in the center comes out with just a bit of moisture but otherwise clean. Let stand for a few minutes before slicing. I’ll be sharing Not Grandma’s Salmon Loaf at Fiesta Friday #268. Fiesta Friday is co-hosted this week by Julianna @ Foodie on Board and Angie, herself, who puts on Fiesta Friday! This entry was posted in Click here for Bargain Meals, Click here for Fabulous Food Posts and tagged Canned Salmon, crackers, Fish and Seafood, leftover fish, leftover Salmon, Lemon, Salmon. Bookmark the permalink. The ingredients sound like my Mom’s except she made it into patties that she cooked in a skillet. I looooooove salmon patties and am excited to try your loaf version! I remember that exact red can of salmon, too. Oh boy!!!! Salmon loaf and creamed peas & pearl onions!!!! Oh my. canned salmon? really? I remember trying it once, and I couldn’t use it. but i trust you. i won’t be making this, but I believe it’s good! It helps me to think of it as just bland, overcooked salmon! 🙂 Brace yourself, there might be another recipe coming out for canned salmon. I brought some boxes of stuff from my folk’s pantry when I left there and just spring cleaned my pantry. I think those cans multiplied in the dark corner, lol! Oh dear poor Mollie! I can visualise the terror scene when the Salmon loaf was being served. It is so nice that you got over your displeasure for the dish and made your own version of it. I love the title, your little story, explanation of the Not Grandmas Salmon loaf , the recipe and the picture. The dreaded salmon loaf! We alternated between that and salmon patties during Lent when I was a kid. Yuck. But like you, I’ve rejigged those recipes and now I love eating them! Great post, Mollie. I love your recipes and I bet I would love this Salmon Loaf. Would Grandma approve?! I have a real thing for salmon at the mo so pinned this for my next salmon day! Thanks! I think Grandma would NOT approve – I am sure it tasted far too good for Lent, lol!! It IS a classic!! Thanks!